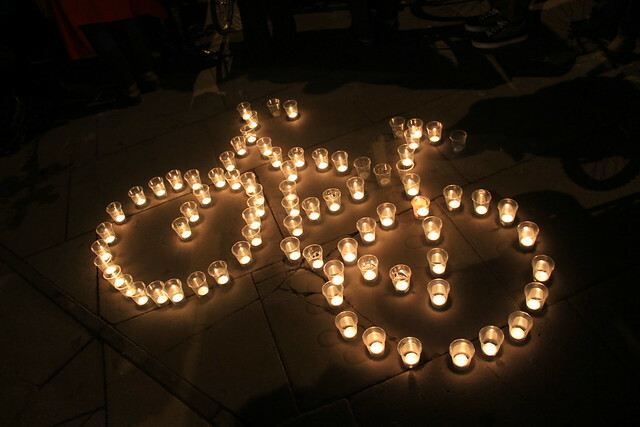 On a cold December night, just a few days short of Christmas, 100s of cyclists, pedestrians, bereaved friends and family and concerned Londoners gathered in King's Cross to remember the 16 cyclists and countless pedestrians who have been killed on London's roads, and the countless number of people who have been hurt or seriously injured. We were there not just to reflect on what has been a terrible year for fatalities, but to demand change. 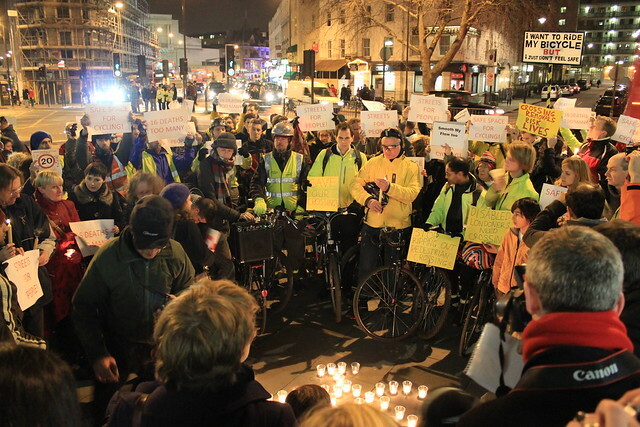 Too often dangerous junctions have been ignored, and recommendations to make roads safer shunned in case it might "disrupt motorised traffic". The human toll of such conditions are no longer acceptable. I spoke with a lady, her grief all too evident, whose husband had been killed on his motorcycle earlier this year. Mrs Dorling, the wife of Brian Dorling who was recently killed at Bow roundabout paused to light a candle. Each of these "fatality statistics" has a human, tragic story. Pedestrian campaigner Caroline Russel told us a story about her friend's father who was killed whilst cycling on his bicycle in King's Cross 14 years ago. Nothing has been done about the accident blackspot since. London Cycling Campaign put out the call to bring us all together at King's Cross, and thanks must go to them for their efforts in helping to make the event a success. Thanks must also go to Assembly Members Jenny Jones (Green), and Caroline Pidgeon (Lib Dem) who attended and have been doing excellent work on cycle safety all year. Meanwhile, Transport for London must be hoping that the safe streets issue will go away over time; that if they obfuscate and delay enough their opposition will evaporate through weariness. 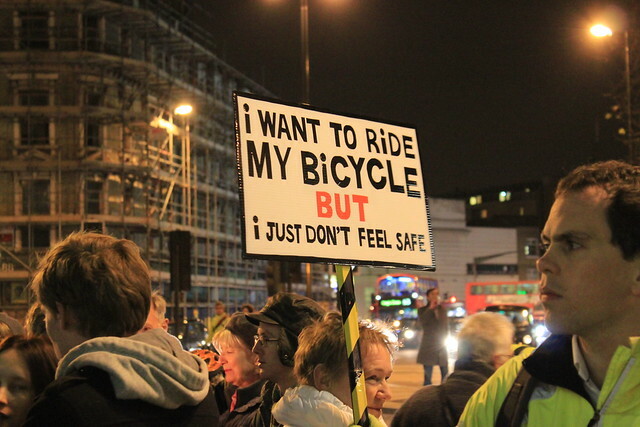 I believe tonight showed clearly that Londoners of all backgrounds care very much about safe streets for all, equality of access throughout our city and subjective as well as statistically safe cycling for all. Tonight saw cycle campaigners, pedestrian campaigners and road danger reduction campaigners coming together and speaking as one. The opposition to "smoothing the traffic flow" to the detriment of other road users is not going to fade away; it's just getting started. Thank you to all who came tonight, who helped to rally numbers, guide the crowds, who spoke and who I may have thrust a candle or a flyer into the hands of! Merry Christmas to all of you, and here's to a safe and prosperous 2012. RoadPeace is the national charity for road crash victims, offering support and guidance to the recently bereaved and campaigning for safer streets based on on the principles of road danger reduction. To make a Christmas donation to support their independantly funded work, click here. All photos on this post used with permission and thanks from London Cyclist blog. Nice to see you, although we barely spoke. Thanks for organising the vigil. I thought it was respectful, tasteful and was well-thought-out. My only and rather mild criticism is that the P.A. system left something to be desired, because, I for one could only barely make-out what was being said over the roar of the traffic. Shortly after you arrived last night you mentioned that TfL had been in contact, but that you thought it was more about the assessing the level of threat than anything else. We'll have to show them that the 'threat level' is too high to ignore. Essentially, we need to be like an unbearable thorn in TfL's shoe. Every time they move, we need them to feel the pain.